There have been numerous events this year marking the 50th anniversary of the Fluxus, including two exhibitions that I visited while I was in New York last month. 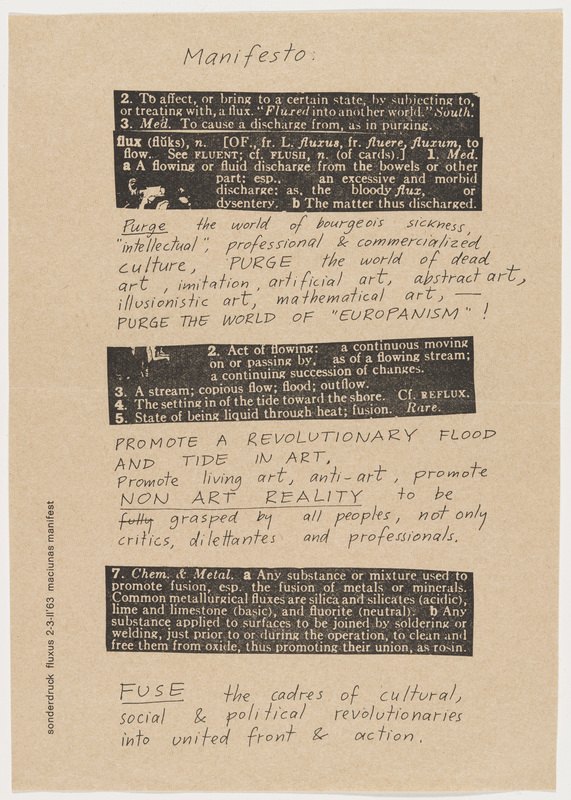 Fluxus was first named by George Maciunas in 1961, and involved a small network of artists in the United States, Europe and Japan who were already exploring some of the new movement’s ideas. Fluxus art generally involved event scores, or series of text or visual instructions that could be used by other artists to perform the works in the manner of a musical score, and the combination of instructional pieces into “Fluxkits” or “Fluxboxes”, collections of printed cards, games and ideas packed into boxes. Although much of this art was meant to be performed live at Fluxus events that ranged from formal concerts to spontaneous street performances and happenings – Fluxus events “could be performed by anyone, anywhere, at any time” – it also created durable works in the form of films, musical instruments, sculptures, and the Fluxkits themselves. These ideas are not unique to the formal Fluxus moment of the 1960s and 1970s. Certainly, many of the ideas were present in Dada several decades earlier, as well as John Cage’s experiments with nondeterminacy in the 1950s. 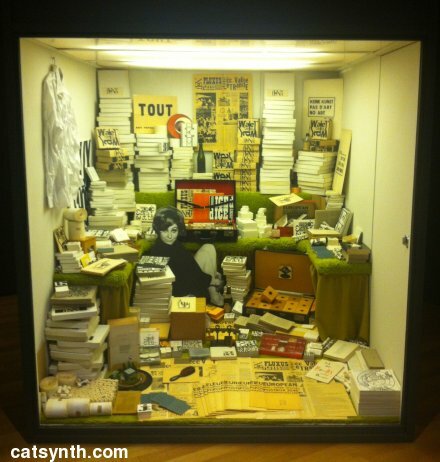 And the elements of Fluxus and its precedents are deeply embedded in contemporary art – the DIY sensibilities are present in many of the exhibitions I attend around San Francisco, for example. As such, the exhibitions are at least as much a historical snapshot of a particular time as they are examples of a particular artistic style and practice. Thing/Thought: Fluxus Editions, 1962–1978 at the Museum of Modern Art (MoMA), presents works from the Gilbert and Lila Silverman Fluxus Collection, which was acquired by the museum in 2008. It was one of the largest collections of its kind and contains over 8,000 artworks and artifacts, including Maciunas’ 1963 Fluxus Manifesto. The manifesto itself contains many of the elements associated with Fluxus, the “do-it-yourself” appearance with combinations of found material, personal notes (typed or handwritten), and declarations of spontaneous activity and a break with the traditional media and practices of art. The duality of an object being at once instructions for a spontaneous artistic expression and itself a work of art appeared throughout the exhibition. This can be seen in the event scores as well as the flux kits. FluxKit 1965-6 is at once a practical and portable collection of objects for generating performances. But the individual pieces, such as the cards with their lettering and geometric shapes, and even the arrangement of the elements into the kit box itself, are quite elegant pieces of design. In particular, the cards seem to embody both the do-it-yourself aesthetic and the prevalent tenets of industrial modernist design in the 1960s. The score for Yoriaki Matsudaira’s Co-Action for Cello and Piano is at once a recognizable extension of traditional music notation and a visual piece with great deal of symmetry and geometry. I have not had a chance yet to try out the piano part myself, but will do so at some point. Perhaps the most intriguing of all the pieces were the instruments in Joe Jones’ Mechanical Flux Orchestra. Each of these instruments, such as the Mechanical Violin and Mechanical Bells incorporate electrical motors and strikers that allow them to be self playing. Although these instruments were created in 1966, they still look contemporary with many of the electromechanical musical installations created today, although the electronic elements have improved. Similarly, Metal Zitar #4 has a striking minimalist appearance that could be part of a contemporary installation. The contributions of Nam Jun Paik to the exhibition also explored the musicality of Fluxus, including it in his “essay” The Monthly Review of the University for Avant-Garde Hinduism! (Postmusic). In this piece, typewritten bits of the text are scattered at odd angles with the same DIY aesthetic as Maciunas’ manifesto and begins with the words “I am tired of renewing the form of music. – serial or aleatoric, graphic or five lines, instrumental or bellcanto, screaming or action, tape or live …”. Yet the art for which he is most known, his beautiful analog video compositions, are quite musical, and indeed he was quite directly influenced by Cage and Stockhausen to produce this body of work. I primarily know Paik and his video art external to any experience with Fluxus. The same can be said for Yoko Ono, who was not formally a member of the group around Maciunas but was a friend and he admired and promoted her work. Her piece Eyeblink (Fluxfilm no. 9) was part of the Silverman collection and included in the exhibition. It’s hard not to notice the way the term “Fluxus” and the prefix “Flux-” permeate so much of the work and any attempt to discuss it. Fluxus spawned, Fluxscores, Fluxkits, Fluxboxes, Fluxfilms (as in the previous piece by Yoko Ono), and even Fluxshops. Willem de Ridder’s European Mail-order Warehouse/Fluxshop from the winter of 1964-1965 contains a jumbled array of Fluxus editions and kits. A reproduction of the Fluxshop by Jon Hendricks and Larry Miller was featured in the exhibition. As much as any piece of the exhibition, it is a snapshot back into the time that this art was originally made. The exhibition will remain on display through January 16, 2012. A concurrent exhibition Fluxus and the Essential Questions of Life at the NYU Grey Art Gallery presented still more original works and artifacts, this time arranged as a series of “essential themes of human existence”, including “Happiness”, “Health”, “Who am I?” and “Freedom”. The arrangement around the themes rather than chronology, medium or artist, gave the presentation a rich multi-media feel. For example, below we see a variety of works for “Happiness”, including a film by Yoko Ono, her conceptual object piece A Box of Smile in the cabinet, as well as others including Nye Ffarrabas’ rather prescient Rx: Stress Formula, a pill bottle with capsules with photocopied bits of paper. The wry sense of humor permeates much of the work in the exhibition, such as Ben Vautier’s glass bottle with a handwritten label “God” affixed to its side as answer to the question “God?” The arrangement by themes and the particular selections of pieces bring out this quality more than in the presentation at the MoMA, even though many of the same artists and types of work were featured. I did also get to see one of Nam Jun Paik’s pieces for modified television set, Zen for TV, which consists of a simple linear pattern crossing the middle of the screen with little or no change. Paik’s process of modifying television sets to produce new analog video art is a direct forerunner of the circuit bending that many of us in the electronic-music community do today. In addition to this exhibition, the gallery featured both historic and more contemporary works created at NYU and the Downtown art scene in the show Fluxus at NYU: Before and Beyond. 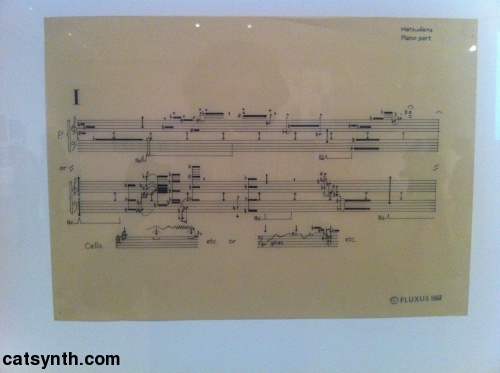 On display were more scores from John Cage as well as a rather large score by Earl Browne. Numerous posters, books and photographs rounded out this presentation of work that, like the original Fluxus group, pushed the boundaries of their media. I regret that I wasn’t around a couple of weeks early when Larry Miller presented a special gallery tour in conjunction with Performa 11, but I am glad I got to see both exhibitions at the Grey Art Gallery before they closed on December 3. Both exhibitions described above were quite inspiring, and it is interesting to note how much both the concepts of Fluxus and some of the artifacts intersect with my own music and performance work several decades later. I expect to have at least as strong an influence on the new work I am planning for next year. It also opens up an idea of whether or not this website can serve as a source for a piece inspired by Fluxus? Any and all ideas are welcome.